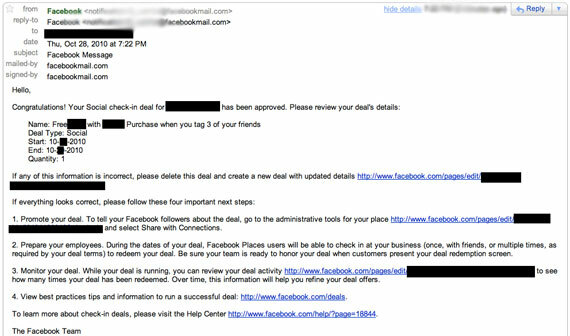 Facebook Already Using Places For Check-in Deals? Just yesterday, we asked if geolocation wasn’t just about money, but Facebook has decided on that route to jump start its Facebook Places check-in service by offering “Social check-in deals”. Is Facebook charging for this service, and if so, how much? How do brands/businesses get in on this program? When will it launch for everyone? Will users see anything different when they check-in? Push notifications on the iPhone app perhaps? Even though this has seemingly rolled out rather soon after Facebook launched Places this summer, we should note that Facebook took a long time to build Places in the first place, so it could certainly be that it had this built out long ago, and are now just starting to roll it out. Maybe even more than the immediate monetary gains that Facebook could get out of this service, probably the longer-term gain right now is simply getting users aware and using the Places feature to start with. Incentives – while not the only way to go for sure – can work in getting people interested in a service, and it the more people that are using Places, the more valuable deals will become. Interesting development, though really not that unexpected. We will email Facebook for comment (and include the questions above) but as it is the evening already, we’re not expecting any response until tomorrow. Update: Facebook got back to us, and had the same response it gave Read Write Web: “As a matter of policy, we don’t comment on speculation. We have nothing to share at this time.” Honestly, usually when a blogger finds something new on Facebook, Facebook will often reply that it is always testing things, so this is actually an unusual response from the social network. For now, we seemingly only have the email above as evidence, and we’ll update if we find any more. That said, it does make perfect sense for Facebook to be doing this, be we can’t be 100% sure right now if/when this will roll out.